You may remember in last week’s review that I suggested that NotesTab would make a decent base for a more fully featured keyboard extension? It seems that another developer had a similar idea. 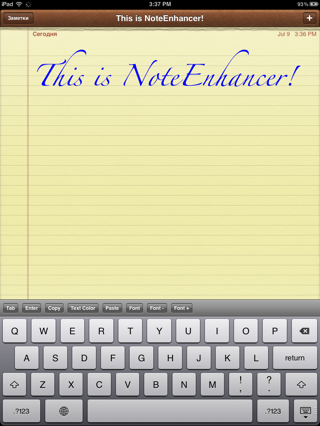 NotesEnhancer is an app which uses a very similar looking button extension to add more functions into the basic Notes app. The thing is, NotesEnhancer’s features are also limited just to the Notes app. The added buttons for Enter, Copy and Paste, strike me as somewhat redundant, considering the iPhone’s built in copy and paste functionality, as well as the return button which features prominently on the default keyboard. The buttons for Text Color, Font style, and Font selection are intriguing, but can also be found in the action menu for Ryan Petrich’s Rich Text For Mail (which also adds the functionality to Notes). On the other hand, Petrich’s app costs $4.99 on Cydia. One thing that strikes me as odd about NotesEnhancer is that it is a paid app, which bears a close resemblance to Notes Tab, down to the Tab key above the keyboard. NotesTab and NotesEnhancer appear to have been published by different developers; perhaps the developers are the same, perhaps this is a coincidence, or perhaps NotesEnhancer’s developer gained permission from NotesTab’s? 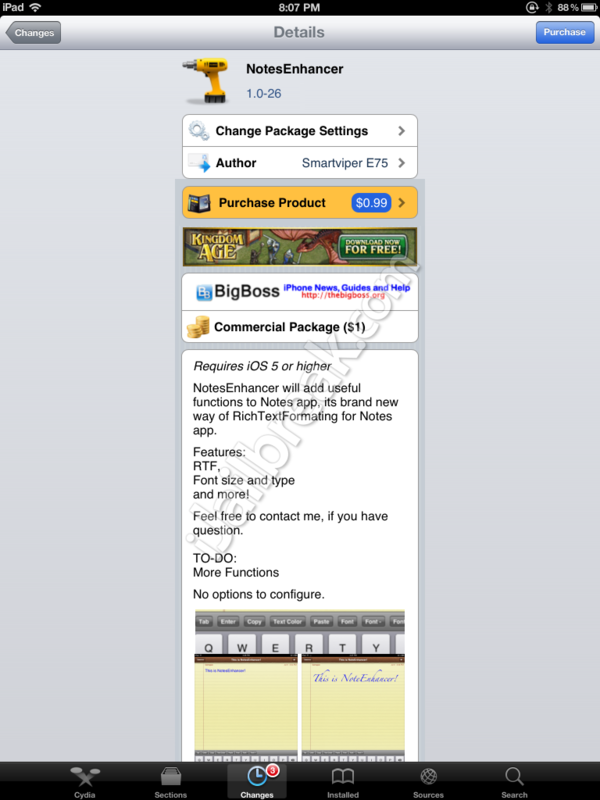 NotesEnhancer is a paid App which costs $1 on Cydia. You can find the app in the BigBoss repository. While NotesEnhancer certainly expands on the feature we’ve seen in NotesTab, it wouldn’t be our first choice for a rich text editor. There are already iPhone apps with text editing capabilities, ranging from apps like Evernote (FREE) to Apple’s Pages ($9.99). Does NoteEnhancer come with this font? What do you think? Would you pay $1 to turn the default Notes app into a basic rich text editor, or would you use a different iOS app? Share your thoughts in the comments section below.